To Celebrate Men’s Health Month, come to enjoy gentle stretches, Qigong theory, relaxation & friendship. Booking essential as spaces are limited. Register now with Sandy: sandyjsky@gmail or 03 2601256. 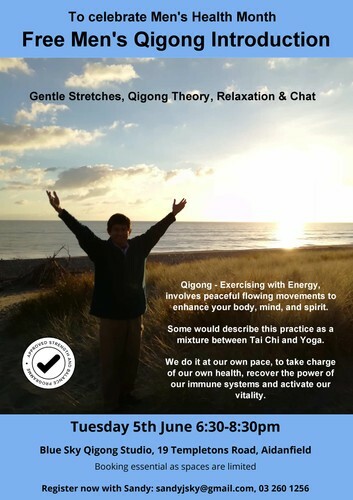 Qigong - Exercising with Energy, involves peaceful flowing movements to enhance your body, mind and spirit. Some would describe this practice as a mixture between Tai Chi and Yoga. We do it at our own pace, to take charge of our own health, recover the power of our immune systems and activate our vitality.